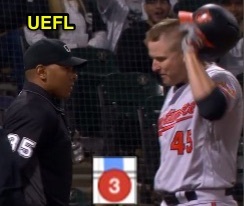 HP Umpire Jeremie Rehak ejected Orioles DH Mark Trumbo (check swing strike three call; QOCY) in the top of the 9th inning of the Orioles-White Sox game. With one out and none on, Trumbo attempted to check his swing on a 0-2 changeup from White Sox pitcher Joakim Soria, ruled a swinging third strike by HP Umpire Rehak. Replays indicate that absent the matter of the check swing, the 0-2 pitch was located over the heart of home plate and at the hollow of the knee (px -.070, pz 1.484 [sz_bot 1.627 / RAD 1.503 / MOE 1.420]), the call was correct. * At the time of the ejection, the Orioles were leading, 3-2. The Orioles ultimately won the contest, 3-2. This is Jeremie Rehak (35)'s second ejection of 2018. Jeremie Rehak now has 7 points in the UEFL Standings (3 Prev + 2 AAA + 2 Correct Call = 7). Crew Chief Bill Miller now has -6 points in Crew Division (-7 Previous + 1 Correct Call = -6). *UEFL Rules 6-2-b-6-a and 6-5-c-5 have been applied. 6-2-b-6-a states, in part, "Quality of Correctness is governed by the (in)correctness of the call made, not by the quality of reasoning given for such a call." Therefore, reason (check swing) is superseded by QOC pertaining to the call made (strike three; QOCY). *This pitch was located 0.768 vertical inches from being deemed an incorrect call. This is the 44th ejection of the 2018 MLB regular season. This is the 23rd player ejection of 2018. Prior to ejection, Trumbo was 1-4 (3 SO) in the contest. This is Baltimore's 1st ejection of 2018, T-3rd in the AL East (NYY 4; TOR 3; BAL, BOS 1; TB 0). This is Mark Trumbo's first career MLB ejection. This is Jeremie Rehak's 2nd ejection of 2018, 1st since May 6 (John Gibbons; QOC = Y [Balk]).